I shall stay right here. And I speak with you! Have given me your heart. Zerfällt in Asch’ und Staub—ja, ja. Kein Vöglein singen will—ja, ja. Falls apart in ashes and dust—yes, yes. How the wood is silent now! No bird wishes to sing—yes, yes. That now have died away. Which it will faithfully guard! The slightly constrained mood of the first song of Op 43 is carried forward into the second, this time in A minor, and also marked Nicht schnell. The autumnal music of the opening is characterized by a flowing thread of semiquaver writing in the viola register of the accompaniment. Staccato markings at the beginning of the vocal line are meant to suggest the sound of falling leaves. The additions of ‘ja, ja’, repeated in the first and second strophes, are entirely Schumann’s—as if these words added weight to a prediction of the doom and gloom of climate change (of an entirely natural kind, but mournful nevertheless). The three verses of the poem are set as AAB—the first two painting the rather depressed colours of autumn in the minor key, the third verse signalling new music on a more optimistic note, and a shift into C major with enlivening triplets running up and down the stave as if sap in a tree returning to life after the winter. This latter season, preferable to the gloom of autumn, is to be welcomed because it is at least a step nearer to spring and the coming year when love will return. The repetition of the word ‘Schmuck’ in both the two final lines of the poem seems clumsy. The poet himself writes ‘Keim’ instead of ‘Schmuck’ in the last line (the imagery is clear here that winter takes away the decorative aspects of autumn while carefully preserving the seed of renewal in the ground). ‘Keim’ would fit the music just as well and it is quite possible that Schumann simply got the word wrong in his hurry to complete the music. The postlude is an extended version of the Vorspiel. Ich sah so schön sie nie. Weil mir’s so wohl gefiel. I never saw them so fair. Because I liked it so much. I saw a delightful scene. Sang me all their thanks. The marking of Zart (Sweetly) is of little use to performers. This indication might encourage the pianist gently to embark on a moderate, wafting tempo, but the singers would be challenged to sing in one breath the four-bar phrase that initiates the vocal line. In fact the setting of the words requires a tempo of considerable joie de vivre. The vocal line is somewhat reminiscent of that of Schubert’s Die Forelle and if the opening semiquavers had been printed in sextuplets (rather than triplets) the similarity would have been even greater. In fact the tempi of these two songs are also similar, although as a check the performers should turn to the end of Schön Blümelein and find the speed at which the sprightly little march for the words ‘Und Schmetterling’ und Bienen, / Die Käfer hell und blank’ sounds bright and perky enough for butterflies and bees. The accompaniment, though rather swift, is no stomp; the phrase ‘gently rippling ebullience’ comes to mind. The introduction romps down the stave in a gambolling succession of thirds and sixths. The four-bar interlude between the second and third verses (and again between the fourth and fifth) is derived from these but in the third bar the hands execute a sequence of curious little twists and chromatic turns (a hemiola of kinds as the harmony changes in sequences of two notes rather than the expected three) before deftly steering the music back to the home key of C major. 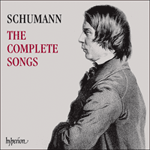 Reinick’s poem has seven verses; for his musical purposes Schumann arranges six of these into pairs, but it is necessary to find a coda for the song to accommodate the seventh verse. In fact, the imagery in the closing words brings home that it is Friedrich Rückert who has inspired Reinick to this kind of verse (as in the animal ballad settings by Loewe like Kleiner Haushalt). The vote of thanks from butterflies and bees strikes a note of Disney-like anthropomorphism, twee by today’s standards for acceptable literature, but definitely a part of the Biedermeier poet’s vocabulary—although prompting a smile and not taken very seriously, even then. The succession of dotted rhythm fanfares with which this song says its goodbyes sounds like a wedding march simply because there is something about it that recalls the music at the end of that celebrated wedding song Helft mir, ihr Schwestern, from Frauenliebe und -leben. Robert Reinick was an important Schumann poet in 1840 (when Schumann came to know him personally in Dresden after 1850 there was friendship, though no further artistic collaboration). The Reinick Lieder eines Malers cycle, six songs Op 36, will appear in volume 11 of this series, together with a biographical note on the poet. The only other Reinick settings are the duet Liebesgarten Op 34 No 1 (see Volume 7) and this piquant little effusion.